The global voice prosthesis devices market was valued at US$ 130 Mn in 2017. It is anticipated to reach US$ 190 Mn by 2026, expanding at a CAGR of 4.5% from 2018 to 2026. Increase in R&D investments by key players has resulted in innovative products. Rise in demand for indwelling voice prosthesis devices is anticipated to fuel the global voice prosthesis devices market during the forecast period. Europe dominated the global voice prosthesis devices market in 2017, owing to the introduction of the latest voice prosthesis and increase in the rate of diagnosis of larynx cancer. The voice prosthesis devices market has high unmet needs and little competition. Medtech companies of varying sizes are attempting to capture their own share of the potentially lucrative global voice prosthesis devices market. Companies are approaching the global voice prosthesis devices market with four main strategies: lifespan of devices, patient preferences or perspectives, cost-effectiveness and clinical effectiveness of various devices, and improvement of clinical outcome. Larynx cancer cases are expected to increase from approximately 177,422 in 2018 to over 216,766 in 2026. Moreover, a rise in laryngectomy and increase in the usage of voice prosthesis devices are likely to drive the global voice prosthesis devices market over the forecast period. However, a rise in cost-consciousness is anticipated to restrain the global voice prosthesis devices market. Health care austerity measures are being incorporated in regions such as North America and Europe. Medtch companies will need to consider the changing reimbursement landscape when determining pricing strategies for their voice prosthesis devices. The global voice prosthesis devices market has been segmented based on valve, device, end-user, and region. 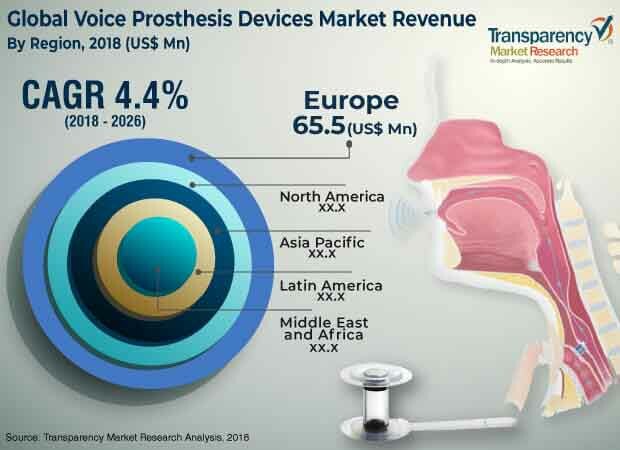 In terms of valve, the provox valve segment is projected to account for a significant share of the global voice prosthesis devices market during the forecast period. The market share of the Blom-Singer valve and provox valve segments is expected to rise in the next few years. In terms of end-user, the global voice prosthesis devices market has been categorized into hospitals & ambulatory surgical centers, specialty clinics, and others. The hospitals & ambulatory surgical centers segment held a major market share in 2017. The segment is likely to account for a leading share of the market during the forecast period. In terms of device, the global voice prosthesis devices market has been classified into indwelling voice prosthesis devices and non-dwelling voice prosthesis devices. The indwelling voice prosthesis devices segment accounted for a major share of the global voice prosthesis devices market in 2017. Rise in demand for voice prosthesis devices is likely to contribute to the growth of the indwelling voice prosthesis devices segments. Demand for indwelling voice prosthesis devices is high due to their technical simplicity, leading to improvement in voice quality and patient satisfaction. In terms of region, the global voice prosthesis devices market has been segmented into North America, Europe, Asia Pacific, Latin America, and Middle East & Africa. North America and Europe accounted for a major share of the global voice prosthesis devices market in 2017. The trend is likely to continue from 2018 to 2026. High diagnosis and treatment rate for larynx cancer, increase in health care budgets by governments, and rise in reimbursement rates are estimated to contribute to the leading market shares of these regions. Asia Pacific is projected to be a highly attractive region of the global voice prosthesis devices market during the forecast period. The voice prosthesis devices market in Asia Pacific is expected to expand at a high CAGR from 2018 to 2026, due to a large number of laryngectomy patients opting for voice prosthesis devices. Demand for voice prosthesis devices is especially high in key countries such as Japan and China. The market in Latin America is projected to expand at a moderate growth rate during the forecast period. Prominent players operating in the global voice prosthesis devices market include Atos Medical, InHealth Technologies, Smiths Medical, Servona GmbH, and Hood Laboratories. Atos Medical accounted for a prominent market share in 2017. The company’s dominance of the market is due to its broad product portfolio, extensive geographical presence, and aggressive acquisition strategies. Atos Medical strengthened its market position by acquiring Heimomed Heinze GmbH & Co. KG in January 2018. Atos Medical acquired Heimomed to strengthen the group’s presence in Germany and Austria. In conjunction with the acquisition, Atos’ customers will also gain access to Heimomed’s high-quality tracheostomy products.